The National Gallery of Victoria moved to the St Kilda Road complex in 1968. Prior to this the NGV was located in Swanston Street, in what is now part of the State Library of Victoria. The St Kilda Road complex was designed by the architect Roy Grounds; and in addition to its fine galleries, the complex also contains many distinct elements. 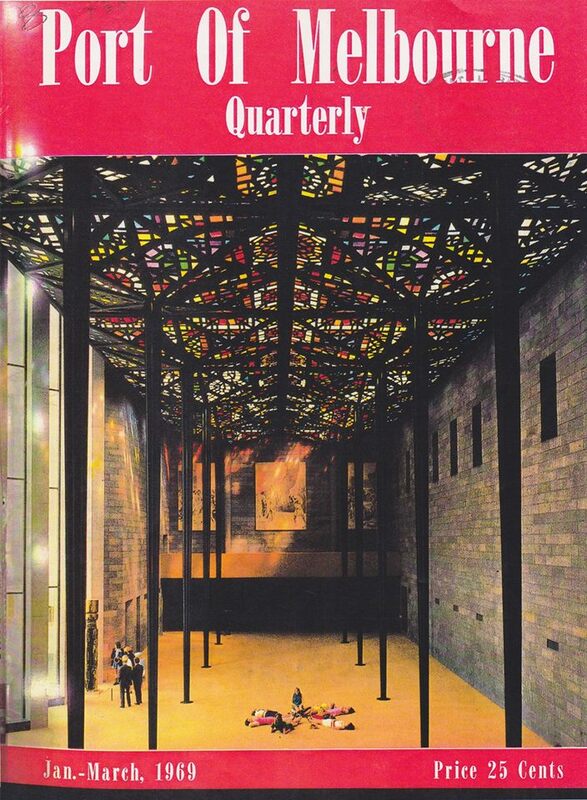 These include the glass waterwall at the arched entrance, the moat surrounding the building; and the Great Hall, which features on the cover of this 1969 edition of the Port of Melbourne Quarterly. Leonard French designed and built the stained glass ceiling of the Great Hall. The ceiling is said to give an effect of being under water when viewed from within this space. As seen in this photograph, people were encouraged to lie on the floor of the hall to appreciate the beauty of its ceiling, and this tradition continues today. Leonard French took five years to complete this stained glass ceiling. Its 2.5 cm thick pieces of glass were imported from Belgium and France, and were cut into smaller pieces by French. Despite significant changes over the years to the NGV St Kilda Road, the Great Hall still retains much of its original character.